Modern neuroradiological tools have made the diagnosis of intraspinal lesions more straightforward and allow for careful pre-operative planning. Dermoid cysts show various and heterogenous magnetic resonance imaging (MRI) intensity corresponding to the variable contents of the cyst, including fat tissue, keratin debris, hair, skin glands and their secretions and calcifications. However, the presentation of an infected spinal dermoid cyst associated with intramedullary abscess and holocord edema or syrinx, poses a pre-operative diagnostic challenge. We present these cases of infected lumbar dermoid cyst and dermal sinus tract, for its notable location and exceptional radiologic findings. The first case is about a 17-month-old boy with an unremarkable birth history who presented to our institution with a 3 month history of decreased oral intake, constipation and regression in developmental motor milestones. He refused to stand or walk and reverted to crawling. There was no history of fever. There were no recurrent bouts of meningitis. The family history is significant for a mother who had recent resection of an unspecified brain tumor. On examination, the patient had good strength in his arms and legs. However, patellar and Achilles deep tendon reflexes were not able to be elicited. There was atrophy of his legs and he refused to bear weight with his lower extremities. There were no signs of myelopathy. Examination of the skin of his lower back showed a midline hyperpigmented macule with a palpable 0.5 cm diameter subcutaneous nodule. There was no visible dimple. Pre-operative MRI of the lumbosacral spine [Figure 1]a and b demonstrated a heterogenous enhancing intradural mass extending from L1 to S1. The mass demonstrated some septated fluid/cystic components. The conus medullaris and cauda equina could not be identified. There was diffuse edema and expansion of the adjacent spinal cord. Intramedullary spinal cord tumor was at the top of the radiological differential diagnosis. In retrospect however, a thin T1 hypointense band (dorsal dermal sinus) could be identified in the posterior lumbar subcutaneous fat extending obliquely toward the thecal sac at the lumbosacral junction. 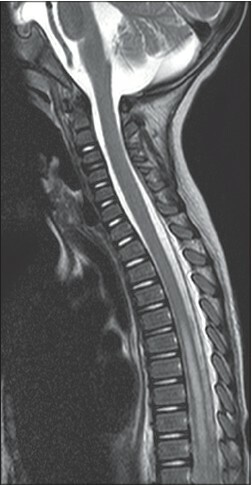 MRI of the cervical spine [Figure 2] showed holocord edema or syrinx up to the level of the medulla. 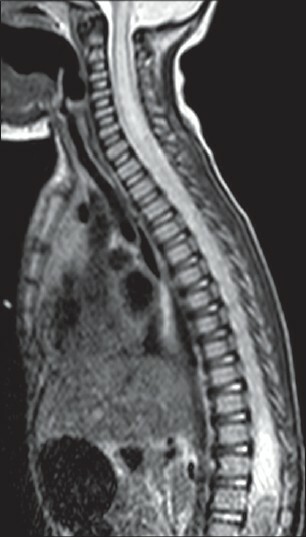 Pre-operative MRI of the brain demonstrated ventriculomegaly. There were no enhancing lesions within the brain. Prior to incision with the patient under general anesthesia and positioned prone on chest bolsters, we identified a small mid-lumbar skin dimple amidst the hemangiomatous skin lesion. We performed an elliptical incision to excise the hemangioma and follow a dermal sinus tract from the subcutaneous layer through a defect in the fascia and L5 lamina to its point of dural penetration. We then proceeded to perform an L1-L5 osteoplastic laminectomy in the standard manner. Once the dura was opened, we observed that the dermal sinus tract terminated in an area of intense arachnoiditis and a bulbous mass that was not separable from the spinal cord or nerve roots. At this point, a diagnosis of dermal sinus tract associated with dermoid cyst was made. The mass was incised, cultures of its contents were taken and caseous material was expressed and resected. We were unable to perform a gross total resection of this dermoid cyst because of its adherence to nearby neural structures. The dermal sinus tract and the dermoid cyst specimens demonstrated dense fibroconnective tissue with florid xanthogranulomatous acute and chronic inflammation with foamy macrophages and foreign body giant cells. Very rare necrosis was noted. Scattered keratin squamous debris and rare hair shafts were present within the inflammation. These histologic findings were most consistent with a ruptured dermoid cyst. Cultures grew Klebsiella oxytoca and Pseudomonas. No evidence of malignancy was observed. The patient experienced transient urinary retention after surgery. The patient was kept in the hospital for 3 weeks of intravenous (IV) antibiotics. His urinary retention and constipation had resolved at the time of discharge. Moreover, just prior to discharge, the patient was ambulating with an assistive device. At 9 months after surgery, the patient continues to do well and remains neurologically stable. A 26-month-old boy with a normal birth history was admitted to our pediatric intensive care unit with fever, neck stiffness, vomiting, lethargy and difficulty bearing weight. His past medical history is significant for at least three episodes of meningitis over the past year, multiple scattered cerebral infarctions, right supraclinoid internal carotid artery stenosis and progressive ventriculomegaly. The patient had normal development until the first episode of meningitis 1-year-ago; since then, he has had a steady decline. A lumbar puncture as part of a work-up for another bout of meningitis was attempted; however, it was a "dry tap." On examination, the patient had good strength in his arms and legs spontaneously. He was hyperreflexic throughout. He had upgoing toes on Babinski response bilaterally. Examination of the skin of his lower back showed a small scab in the area of his prior lumbar puncture. There was no obvious dimple. There were no other unusual cutaneous stigmata. 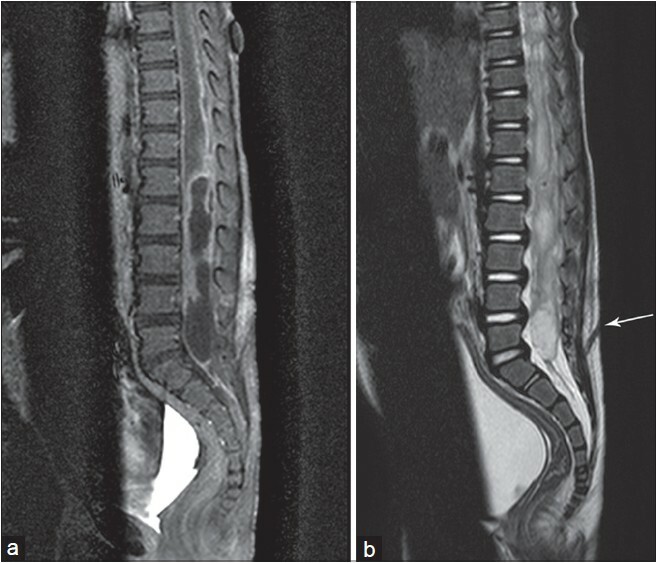 Pre-operative MRI of the lumbosacral spine [Figure 3]a and b demonstrated a heterogenous thick rim-enhancing intradural mass extending from L1 to S1. The mass demonstrated multi-septated fluid/cystic components. This mass filled and expanded the thecal sac with widening of the distal thoracic and lumbar bony spinal canal. The conus medullaris and cauda equina could not be identified. There was expansion and T2-hyperintense signal from T4 along the caudal length of the spinal cord [Figure 4]. Most importantly with experience gained from our previous case, close attention was paid to radiographic features of occult spinal dysraphism. Indeed, there was a dorsal dermal sinus tract identified at the lumbosacral junction with communication from the skin at L5 to the intrathecal contents just below the S1 posterior elements. Pre-operative MRI of the brain demonstrated ventriculomegaly with transependymal flow. There were no enhancing lesions within the brain. Due to signs of increased intracranial pressure, an external ventricular drain was placed before addressing the spinal pathology. The opening pressure was moderately high at 20 cm of water. We then positioned the patient prone on chest bolsters. Prior to incision, we identified a small lower lumbar skin dimple underneath scab. We performed an elliptical incision to excise the dimple and follow a dermal sinus tract from the subcutaneous layer through a defect in the fascia and S1 lamina to its point of dural penetration. We then proceeded to perform an L1-L5 laminectomy in the standard manner. Once the dura was opened, pus was encountered and cultured. We found that the dermal sinus tract terminated in a dermoid cyst densely adherent to the spinal cord or nerve roots. At this point, a diagnosis of dermal sinus tract associated with dermoid cyst was confirmed. The dermoid cyst was incised and cheese-like material was expressed and resected. We performed a partial resection of the dermoid cyst. The histologic findings were consistent with a dermal sinus tract associated with a ruptured dermoid cyst. Cultures grew Enterococcus faecalis and Escherichia More Details coli. No evidence of malignancy was observed. The patient was unable to be weaned from the external ventricular drain. He subsequently underwent ventriculoperitoneal shunt placement. The patient was kept in the hospital for 3 weeks of IV antibiotics. At the time of discharge, he was walking independently and had normal bowel and bladder function. At 6 months after surgery, the patient continues to do well although he remains developmentally delayed. 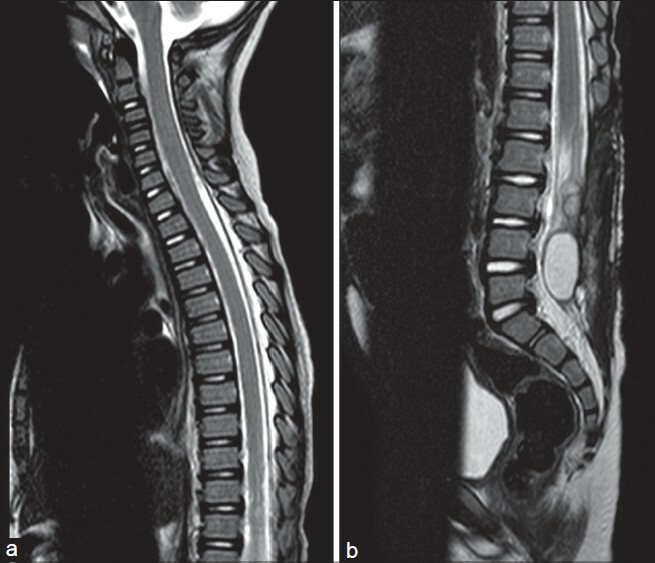 Follow-up MRI shows partial decompression of the dermoid cyst, interval resolution of syrinx and improved spinal cord edema [Figure 5]a and b.
Spinal dermal sinus tracts may cause cutaneous abscess, meningitis, or intraspinal abscess by a contiguous route for transmission of bacteria. Approximately half of all dermal sinus tracts have associated dermoid or epidermoid cysts, at the end of the tract, which may cause symptoms of spinal cord or root compression. Dermoid cysts are uncommon benign maldevelopmental lesions that can occur anywhere along the neuraxis. These are considered to be the end product of a defective closure of the neural tube occurring between the 3 rd and 5 th weeks of gestation. Dermoid cysts originate from trapped fragments of the primitive ectodermal layer and mesenchymal elements within the closing neuroectodermal folds. This explains their predilection for midline localization. Intramedullary abscess of the spinal cord is a rare complication of a dermal sinus tract. Contiguous spread of infection via a spinal dermal sinus tract may represent a plausible mechanism leading to the development of intramedullary abscess in children. ,,,, Medical treatment alone, consisting of long-term antibiotics may be tried in selected cases. 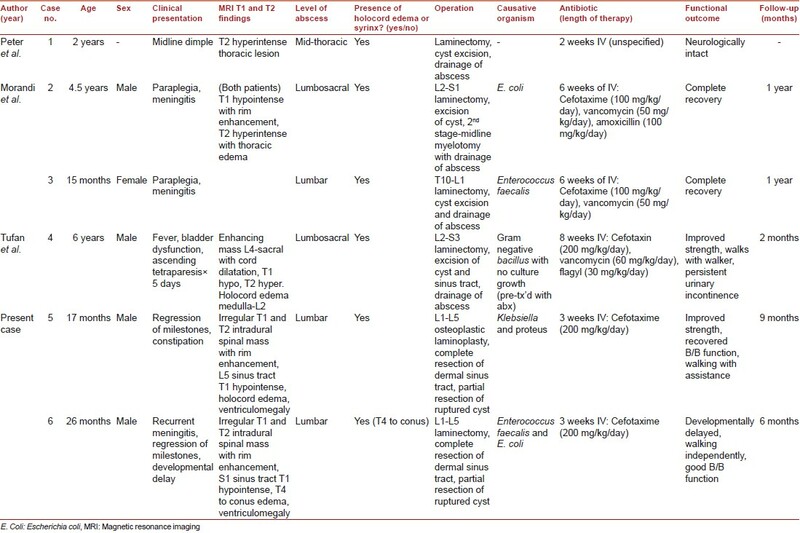 , The majority of authors, however, recommend neurosurgical intervention consisting of excision of the dermal sinus tract and dermoid cyst together with the drainage of pus by means of limited laminectomy and myelotomy ,,,,, [Table 1]. It is unclear whether complete resection of the dermoid cyst offers an advantage over partial resection in improved long-term outcome. Complete resection of a ruptured infected dermoid cyst may be treacherous as it is likely densely adherent to surrounding nerve roots and spinal cord. Few cases of intramedullary abscess secondary to infected dermoid cyst and related holocord edema or syrinx have been reported. ,, Neurological deficits in these patients have ranged from tetraparesis to paraparesis, as in our patients. The pathomechanism of the holocord edema or syrinx is unclear. Inflammation, infection and associated venous congestion within the spinal canal may be an underlying etiology. Likewise, widespread arachnoiditis from both infection and chemical meningitis and obstruction of the central canal or other alterations of CSF circulation, as in intramedullary spinal cord tumors, may represent another cause. 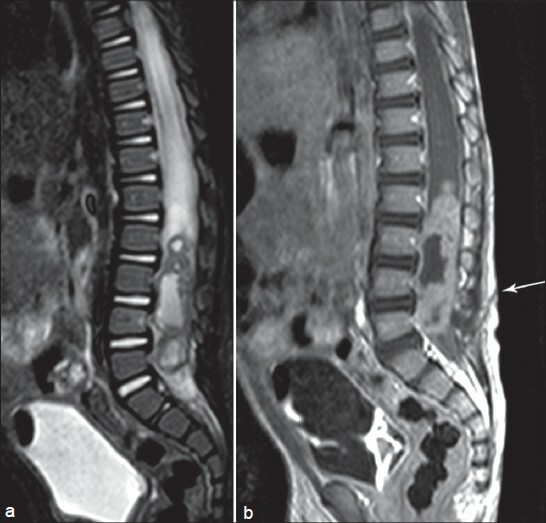 There are three major MRI characteristics for presumptive diagnosis of intramedullary spinal cord tumors: Expansion of the spinal cord; the presence of nodular contrast enhancement; and formation of cystic elements. ,,, These same radiologic features of intramedullary spinal cord tumors are shared with our case: Spinal cord expansion from the intramedullary abscess and holocord edema or syrinx; thick nodular enhancement of the abscess capsule; and cystic formation from the necrotic epicenter of the abscess and holocord syrinx. However, the presence of a concurrent dermal sinus tract on pre-operative imaging was more consistent with infected or ruptured dermal cyst. We present two unusual cases of children with intramedullary abscess and holocord edema secondary to an infected lumbar dermoid cyst presenting with paraparesis and regression of developmental milestones. The constellation of radiographic findings mimicked that of an intramedullary spinal cord tumor with syrinx. The pathomechanism for the holocord edema or syrinx is not clearly elucidated. Like most authors, we recommend prompt surgical treatment including the resection of the dermal sinus tract and dermoid cyst and drainage of the intramedullary abscess. 1. Pant I, Joshi SC. Cerebellar intra-axial dermoid cyst: A case of unusual location. Childs Nerv Syst 2008;24:157-9. 2. Ziv ET, Gordon McComb J, Krieger MD, Skaggs DL. Iatrogenic intraspinal epidermoid tumor: Two cases and a review of the literature. Spine (Phila Pa 1976) 2004;29:E15-8. 3. Murphy KJ, Brunberg JA, Quint DJ, Kazanjian PH. Spinal cord infection: Myelitis and abscess formation. AJNR Am J Neuroradiol 1998;19:341-8. 4. Chan CT, Gold WL. Intramedullary abscess of the spinal cord in the antibiotic era: Clinical features, microbial etiologies, trends in pathogenesis, and outcomes. Clin Infect Dis 1998;27:619-26. 5. Simon JK, Lazareff JA, Diament MJ, Kennedy WA. Intramedullary abscess of the spinal cord in children: A case report and review of the literature. Pediatr Infect Dis J 2003;22:186-92. 6. Tufan K, Cekinmez M, Sener L, Erdogan B. Infected lumbar dermoid cyst presenting with tetraparesis secondary to holocord central lesion. J Child Neurol 2008;23:934-7. 7. Kwinta B, Adamek D, Moska³a M, Stachura K. Tumours and tumour-like lesions of the spinal canal and spine. A review of 185 consecutive cases with more detailed close-up on some chosen pathologies. Pol J Pathol 2011;62:50-9. 8. Herman JM, McLone DG, Storrs BB, Dauser RC. Analysis of 153 patients with myelomeningocele or spinal lipoma reoperated upon for a tethered cord. Presentation, management and outcome. Pediatr Neurosurg 1993;19:243-9. 9. Pansey BK, Verma A, Sood PK, Chabra SC, Pansey M. Dermoid tumours occurring at the site of previous meningocele repair. Clin Neurol Neurosurg 1988;90:137-40. 10. Cobbs CS, Pitts LH, Wilson CB. Epidermoid and dermoid cysts of the posterior fossa. Clin Neurosurg 1997;44:511-28. 11. Tsurubuchi T, Matsumura A, Nakai K, Fujita K, Enomoto T, Iwasaki N, et al. Reversible holocord edema associated with intramedullary spinal abscess secondary to an infected dermoid cyst. Pediatr Neurosurg 2002;37:282-6. 12. DiTullio MV Jr. Intramedullary spinal abscess: A case report with a review of 53 previously described cases. Surg Neurol 1977;7:351-4. 13. Bunyaratavej K, Desudchit T, Pongpunlert W. Holocord intramedullary abscess due to dermal sinus in a 2-month-old child successfully treated with limited myelotomy and aspiration. Case report. J Neurosurg 2006;104 4 Suppl: 269-74. 14. Morandi X, Mercier P, Fournier HD, Brassier G. Dermal sinus and intramedullary spinal cord abscess. Report of two cases and review of the literature. Childs Nerv Syst 1999;15:202-6. 15. Peter JC, Sinclair-Smith C, de Villiers JC. Midline dermal sinuses and cysts and their relationship to the central nervous system. Eur J Pediatr Surg 1991;1:73-9. 16. Takemoto K, Matsumura Y, Hashimoto H, Inoue Y, Fukuda T, Shakudo M, et al. MR imaging of intraspinal tumors - Capability in histological differentiation and compartmentalization of extramedullary tumors. Neuroradiology 1988;30:303-9. 17. Garcés-Ambrossi GL, McGirt MJ, Mehta VA, Sciubba DM, Witham TF, Bydon A, et al. Factors associated with progression-free survival and long-term neurological outcome after resection of intramedullary spinal cord tumors: Analysis of 101 consecutive cases. J Neurosurg Spine 2009;11:591-9. 18. Fehlings MG, Mercier D. Factors predicting the resectability of intramedullary spinal cord tumors and the progression-free survival following microsurgical treatment. J Neurosurg Spine 2009;11:588-9. 19. Manzano G, Green BA, Vanni S, Levi AD. Contemporary management of adult intramedullary spinal tumors-pathology and neurological outcomes related to surgical resection. Spinal Cord 2008;46:540-6.